What can be cooler than living longer, happier, and healthier? We don’t do soft drinks or computers. We don’t do cars and motorcycles, or any of the things advertising people traditionally think are cool. What we find cool are the drugs, biologics, devices, diagnostics, etc. that change the way we care for peoples’ health. What can be cooler than living longer, happier, and healthier? Our job is to get your brand noticed—for all of the right reasons. We bend the rules of traditional healthcare communications until they say uncle. We know it’s tough out there… and a message ignored is, quite frankly, a message ignored. Does that level of engagement make us crazy? Maybe just a tad. 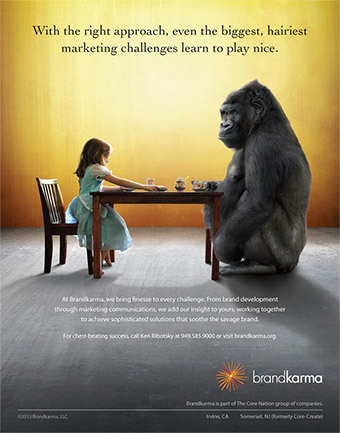 We have worked hard to create the perfect soup of talent and people at Brandkarma. It’s one part experience, one part talent, and the BAM of our passion, which makes all the difference. You will not find these qualities anywhere else. We feel strongly about this.